Children's Stories - Heave Ho! "Jelani, a big tree trunk rolled on top of our ant hill during the night," Pemba said. "Would you come and move it. You’re so big and strong." Jelani smiled at the ants. "Of course, I can move the tree. I’m an elephant, aren’t I?" he boasted. He followed the ants to their anthill. "That’s a big tree," he gulped, "but I can do it." The elephant squeezed his trunk under the log and tried to lift it. He made all kinds of groans and moans but the log was too heavy. "Can’t you do it?" Pemba asked. "Of course I can. I’m just warming up. Here I go," Jelani said and tried to lift it again. He groaned and he grunted, but as hard as he struggled, he couldn’t lift the log. "I don’t think you can do it, Jelani. It’s too heavy. All of the ants, except Zina and I are stuck inside the anthill. They can’t get out until the log is moved. What are we going to do?" Pemba worried. "I’ll do it. It’s very heavy. Let me try again," Jelani said. He took a deep breath and with all his might he tried to lift the heavy log, but it didn’t budge. Just then Catara, a girl elephant came walking by. "What’s going on here?" she asked a small mouse who was sitting nearby watching. The mouse answered, "Jelani is trying to move the log that fell on our ant hill, but he can’t do it. It’s too heavy for him." Catara moved closer to Jelani. "Do you need some help, Jelani?" Jelani knew that he couldn’t lift the log by himself. "Sure, Catara. Two trunks are better than one!" Catara squeezed her trunk under the log. "One, two, three, lift." 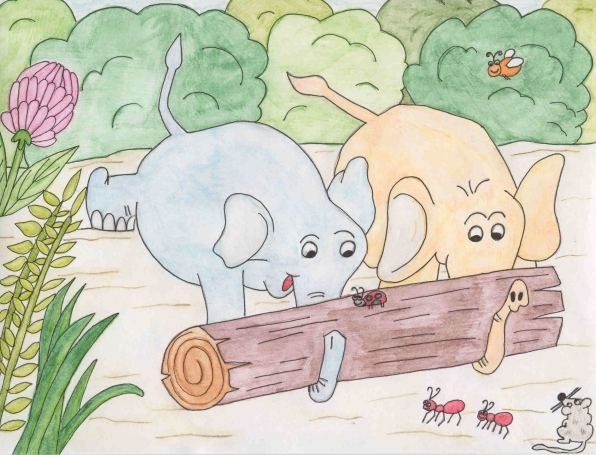 The two elephants lifted the log and carried it off the anthill. They dropped it in the bushes. "That was heavy!" The ants ran over to their anthill. It was flat. The other ants came crawling out of the smashed hill. "Thanks Jelani and Catara," the ants said and ran off into the woods to find some leaves. "Do you want to go to the river?" Catara asked the other elephant. Jelani agreed and the two ran down to the water.